Early Wednesday afternoon, from Pasadena’s Memorial Park, a light twinkled in the distance. 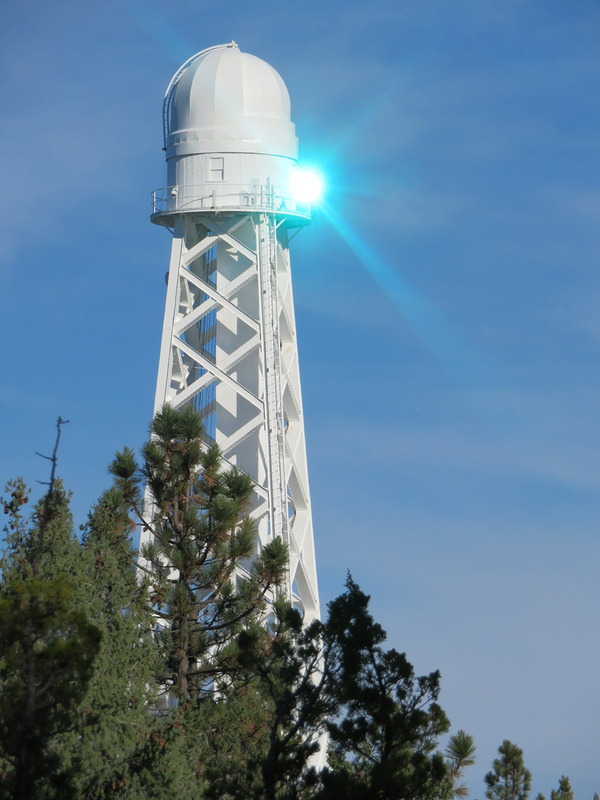 It looked like a star, albeit one that shone in brilliant shades of colors like red and green, guiding viewers towards Mount Wilson Observatory. Standing next to me is Dan Kohne, a trustee at the Mount Wilson Institute, who is controlling the colors from his phone. He can set it to flicker through a rainbow of hues, or sit stationary on one. From a computer, he can program where the light will appear. Throughout the course of Fulcrum Arts’ AxS Festival, which opened on November 2 and runs through November 11, this light has been scheduled to shine for onlookers at various locations in Pasadena. 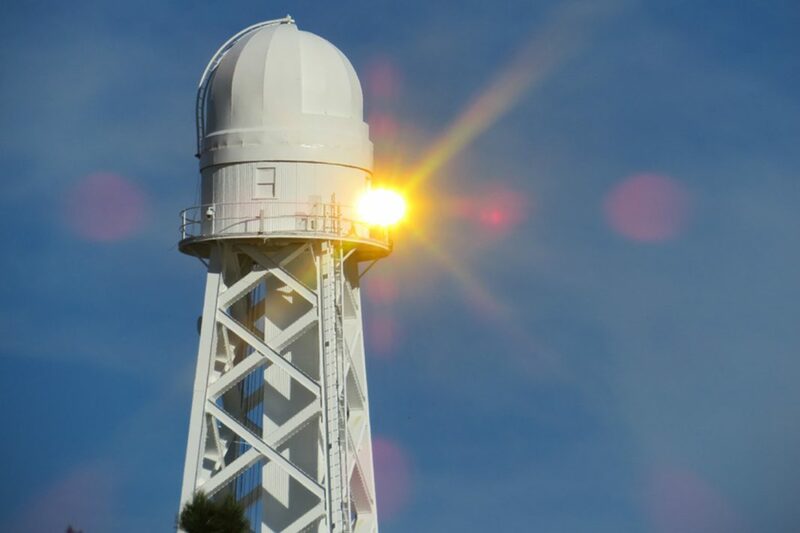 Sunstar, a collaboration between artist Liliane Lijn and astrophysicist John Vallerga, is an installation currently on loan to observatory, where it’s situated on the Solar Tower. 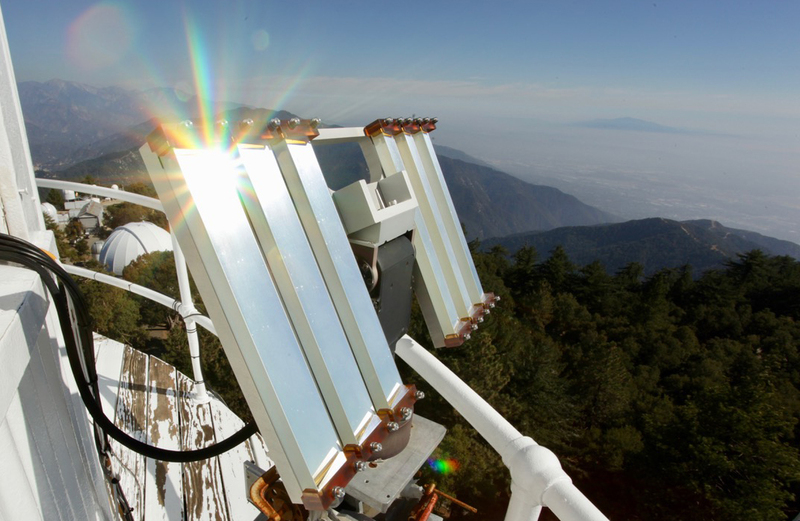 It uses sunlight, prisms, and a computer to create that glimmer from Mount Wilson. The story of Sunstar begins at UC Berkeley, where Vallerga is a researcher and Lijn was an artist-in-residence at the school’s Space Sciences Laboratory. Previously, Vallerga had noticed how sunsets reflect off windows of homes in the Berkeley Hills. He and another colleague had once casually talked about how interesting it would be if they could use a mirror to play with that light. That idea didn’t come to fruition, but Lijn has used light in art throughout much of her illustrious career. Vallerga saw Lijn speak and decided to ask her about a possible collaboration. They discussed using prisms instead of mirrors. “Rather than reflecting light the same color as the sun, we could spread it out into its colors and project rainbows,” says Vallerga, by phone. The collaboration began in 2006. “I envisaged it as stars outlining the horizon connecting earth to sky,” Lijn explains via email from her home in the U.K. The initial project, called Solar Hills, went through a few different incarnations leading up to Sunstar. They did a variation of the installation on the Golden Gate Bridge for the San Francisco landmark’s 75th anniversary in 2012. That one relied on mirrors instead of prisms as a means of dealing with potential wind-related problems. They experienced communication issues due to heavy cell phone use in the area, especially at rush hour. “We lost communication at 5:30 every day,” Vallerga recalls. It was, conceptually, a perfect fit. Mt. Wilson Observatory was founded in 1904 by George Ellery Hale, famed for his work studying the sun. This year marks the 150th anniversary of Hale’s birth. And so Sunstar becomes both a reference to how the installation works as well as the history of its current location. On Sunday, the final day of AxS Festival, it will be on view for the Sun Day Star event at Memorial Park. Lijn has a different batch of colors in store for the presentation and the art will be accompanied by a wasteLAnd chamber music concert. Sun Day Star is November 11 from noon to 4 p.m. at Memorial Park, 85 E. Holly St., Pasadena. Check the AxS Festival schedule for more opportunities to view Sunstar. RELATED: The Best Exhibits at Museums and Galleries in L.A.